Happy Memorial Day. Let's take a moment to remember the fine men and women who have served this country. In that spirit, I am devoting today's Friendly Encounters to two individuals who have done great work for the veterans of this country. Liz Belcaster of the Northwest Side Irish works tirelessly on many causes. She is a dynamo. The NWSI Parade is always a highlight in the community. I have had the pleasure and privilege of marching in it the last two years. 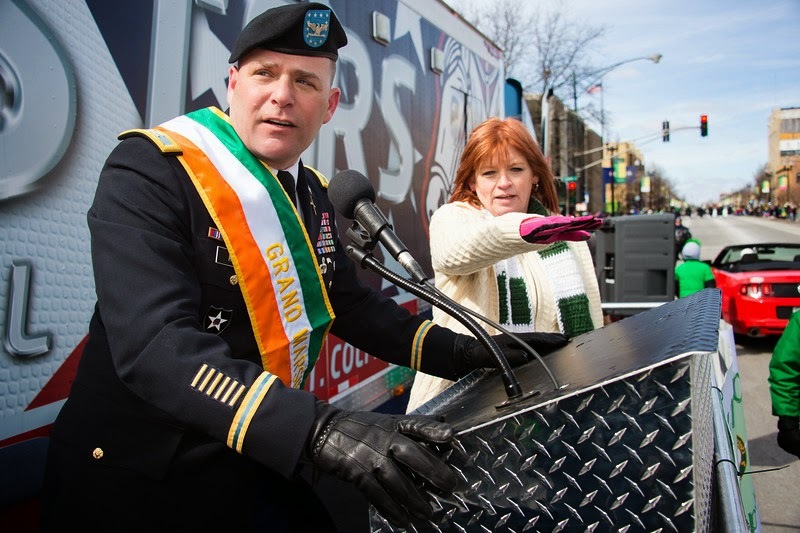 At the 2014 NWSI parade, Col. Adam Rocke was the Grand Marshall. I witnessed him talk passionately about his service to the country and his efforts to help veterans. My interview with him appeared yesterday. Col. Rocke and Belcaster are to be applauded for their efforts. They are very actively doing great work for the men and women who have served this country. They do this selflessly and without enough recognition. They could never truly get enough recognition, but I am trying to shine a little more light on these two fine individuals. Please rewatch the interview found here yesterday. Help the cause in any way you can. If nothing else, at least keep these fine people in your thoughts and prayers. Thank you Col. Rocke and Liz Belcaster. I am proud to know both of you. Col. Adam Rocke and Liz Belcaster in Chicago, IL-March 2014.